ARLINGTON, Va. (CNS) — Susan Pawlukiewicz traveled to Poland three years ago bearing immense grief over the recent loss of her mother. About seven weeks later, she returned to the United States with a sense of peace and gratitude — and a duffel bag filled with 35 rolled-up prints. 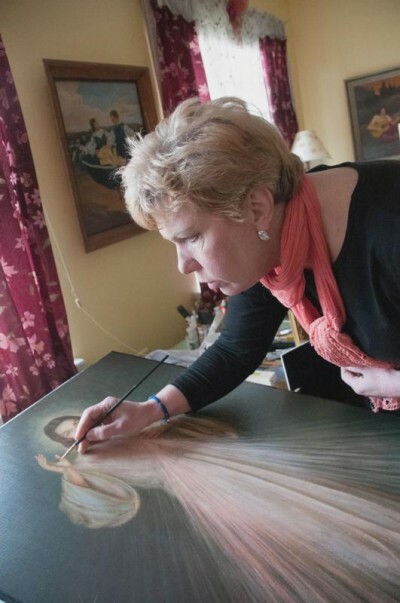 She wasn’t sure what to do with the large pieces of art, but the image they contained — the Divine Mercy — resonated deeply with her. “I’d found a place where I could go that gave me tremendous compassion and comfort in my loss: the merciful heart of Jesus,” said Pawlukiewicz. The experiences on that trip to Poland and the contents of her bag eventually grew into an ambitious ministry of promoting the Divine Mercy devotion throughout the Washington region. Pawlukiewicz, who proudly is “100 percent Polish,” said her efforts are in part a way to dedicate her life to God and to thank him for her mother. She was “the most lovely and loving person I’ve ever known,” said Pawlukiewicz. The devotion to Jesus as the Divine Mercy is based on the writings of St. Faustina Kowalska, a young Polish nun who died of tuberculosis in 1938. On the second Sunday of Easter in 2000, St. John Paul II canonized Sister Faustina while establishing the liturgical date as “Divine Mercy Sunday.” This year it is April 3. During her short life, St. Faustina reportedly received messages from Jesus, which she recorded in a diary. In one of her entries, she described in detail how Jesus appeared to her and his desire that she “paint an image according to the pattern you see, with the inscription: ‘Jesus, I trust in you. '” At St. Faustina’s request, an artist created the image of Jesus with a hand raised in blessing and red and pale rays of light emanating from his heart. A version of that painting is on the prints Pawlukiewicz brought back with her to her Alexandria home, where her mother spent the last 10 years of her life. Around the same time her mother died, Pawlukiewicz also lost her job in shipbuilding and design. It was a painful period, and with no family in the United States, Pawlukiewicz booked a trip to Poland to visit relatives. Once there, she found herself being led to a number of pilgrimage sites of St. Faustina. In Lagiewniki — a suburb south of Krakow and the location of the saint’s remains, as well as this summer’s World Youth Day — Pawlukiewicz purchased the nearly three dozen prints of the Divine Mercy. So far, she’s gifted around 20 to a variety of Catholic institutions. Several Arlington diocesan parishes have received the image, along with a crisis pregnancy center; the Daughters of St. Paul in Alexandria and the Little Sisters of the Poor in Washington; and local schools, including Christendom College in Front Royal, the University of Mary Washington in Fredericksburg and what is now Divine Mercy University in Arlington, formerly the Institute for the Psychological Sciences. Pawlukiewicz said she follows St. Faustina’s apostolate as strictly as possible. In her diary entries, the saint writes of Jesus’ desire that there be a Divine Mercy image for veneration in the main worship area of every chapel or church. So, a pastor, chaplain or mother superior accepts the images from Pawlukiewicz with the explicit provision they will be placed and venerated as specified in the diary. Before giving the images, she spends up to 20 hours meticulously preparing them. Selecting frames at thrift and consignment stores, she refurbishes them through sanding and painting. The original paintings say, “Jesus I trust in you” in Polish, so Pawlukiewicz repaints the words in English. She sometimes accents Jesus’ wounds with red paint to ensure they show up clearly. An engraved plate identifies the image as a gift from her and in memory of one of her family members. Pawlukiewicz plans to obtain additional images from Poland once the initial 35 are distributed. The Divine Mercy ministry has led to “an enormous change of work and priority in my life,” said Pawlukiewicz. Much of her time is spent on her ministry, but she also creates and sells nautical art, works part time as a substitute teacher and writes for a marine engineering magazine. She stepped up her efforts to promote the devotion following Pope Francis’ announcement of the Jubilee Year of Mercy. She has organized a traveling Divine Mercy image that stays in homes for several weeks, with host families agreeing to pray the chaplet in front of it daily. Last year she purchased and distributed 4,000 Divine Mercy prayer cards on Divine Mercy Sunday. This year her goal is to give out 11,000. Pawlukiewicz also offers short talks on the devotion to parishes and other interested groups. One of the most rewarding aspects of her ministry, she said, is when she’s asked to pray the Divine Mercy chaplet at the bedside of the sick or dying. All her efforts are about giving people the opportunity to develop a friendship with God “in their own personal way,” she said. Scott is a staff writer at the Arlington Catholic Herald, newspaper of the Diocese of Arlington.